From register or server cash-outs, cash control, debit card and bank deposit management, to advanced sales mix reporting, cost of sales mix and promotion analysis, HyperVision™ empowers you, a restaurant professional, with integrated online tools you need to manage your restaurant operation more effectively, even from home or when on holidays. This industry, your industry, is too well known for the long hours required. That's why we've designed HyperVision™ to streamline and automate restaurant management tasks. Imagine performing end of shift and daily tasks from anywhere, anytime. Imagine knowing how busy your restaurant is or when cash shortages occur, even when you are on holidays 50,000 miles away from your location. 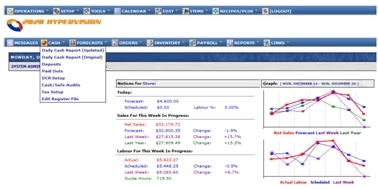 With HyperVision™, you can perform scheduling, order stock, analyze sales, project sales, track inventory and monitor (live via the web) real time sales, labor costs, inventory levels and even watch your employees perform their duties. And you can do this from home or 50,000 miles away from your restaurant location. And our complete online restaurant management system can be integrated with nearly any existing restaurant POS system. HyperVision™ will save you money while helping you manage your restaurant business.